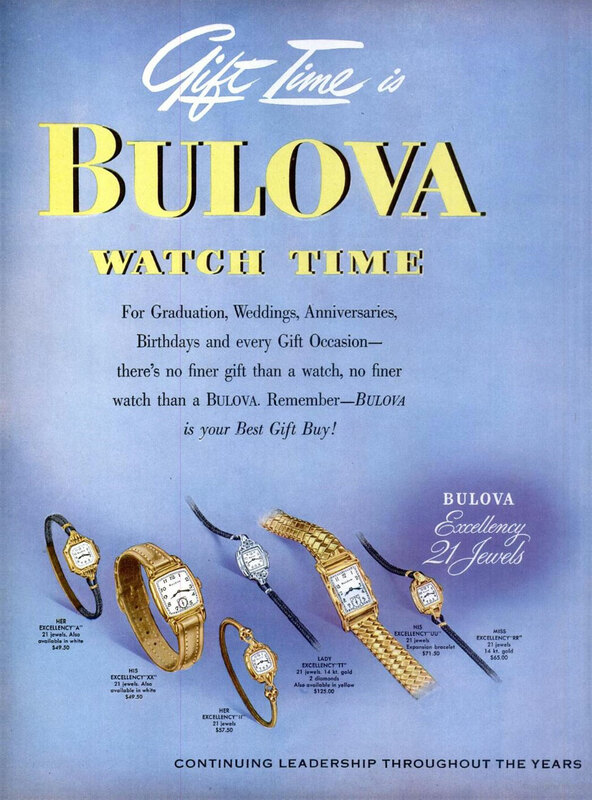 Bulova 1949 Her Excellency "MM"
So I picked this up because I believe it is probably an Academy Award watch. It is the same case as the "F" variant but with a dial like the "J" and "H". The "A" has the curtain dial with a "J" having this dial. The "B" has a curtain dial and the matching "H" with this dial. So my thought is that the "F" has a sister watch with this dial. But it is just a guess until an ad might show up for it. Until then I will keep it just in case. It is 10K gold filled, has a 21 jewel 6BA working movement. What are your thoughts? Should it be a "F" or Unknown or a generic Academy Award? Update: Found an ad for Her Excellency "MM" that matches this watch. Replacing ad. Is this the same watch? 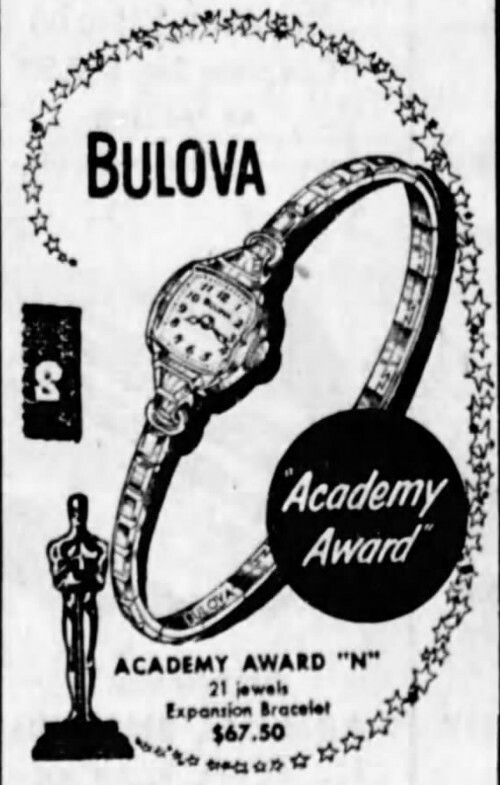 1950 Bulova Academy Award "N"
I don't think so. It is exactly the same case as the "F". I was thinking maybe the "FF" was close. Honestly I don't think there is an ad for it that I can find. The case does look like the 'F' to me. I think F would work until an ad would show differently because of the case match. I am thinking it is the original dial and a different variant but it is just speculation on my part. for the time being, as opposed to labeling it an "F" with a different face. My gut feeling is that it's a currently undocumented variant. I'm more inclined to go either unknown or Her Excellency. It might be part of the AA series, but could also be from a number of others. $62.50 woud put the case as solid gold. moving my comment to the end of the thread. 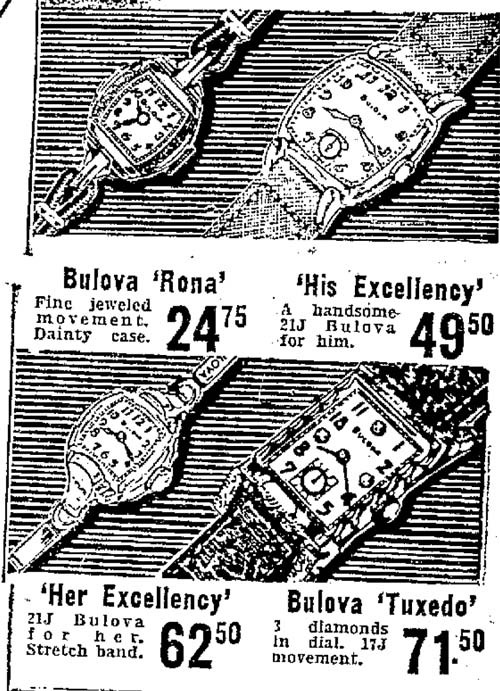 1949 Bulova Miss Excellency "RR"
Sure looks that way, but Miss E "RR" is solid gold...... subject watch is plated . You have raised a valid point though. Case appears to be the same design for the AA, Her E and Miss E. Is it possible this is one of those confusing ones where the date, band (cord or metal) and gold or plated could be the determining factor in name? The AA "F" as an example is plated and more expensive than the plated Her Excellency you reference. The Miss Excellency "RR" is listed as solid gold and cheaper.....I'm confused. Is the AA more expensive because of the name?